Mastering an instrument is first and foremost about passion and discipline - but you’ll require information and guidance as well. A lot of the latter can be found online. One of the most common—and commonly broken—New Year’s resolutions is to learn to play a musical instrument. 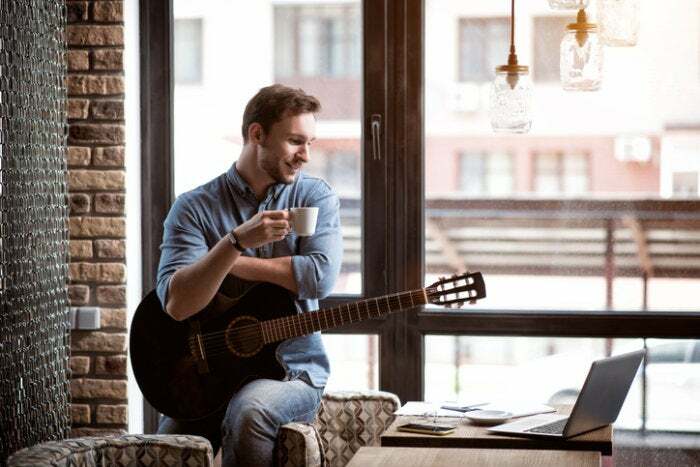 A lot of people aspire to make music, but many find the barriers to entry too overwhelming to overcome - like knowing where to start, paying for proper lessons, or even getting familiar with the basics of music. Contrary to popular belief, you don’t need to spend a ton of money on a personal instructor to learn to play. With a powerful, versatile computer like the Lenovo Flex 4, you can take advantage of the wealth of resources the Internet has to offer. Here are some great sites to get you started. There’s no rule that says you have to learn to read music to play a musical instrument. Musicians as renowned as The Beatles, Jimi Hendrix, and Kanye West couldn’t read or write staff notation. But it can make learning your instrument easier down the road, and if you plan on playing classical or jazz, it’s a must. Read Music Free provides a wealth of games, tools, and free lessons to teach you how to sight read music. It also has a small selection of tools geared specifically for budding guitarists and pianists. No matter what instrument you want to learn, though, this is a great place to start. Understanding sheet music will allow you to play all your favorite songs, but if you want a deeper understanding of music theory, check out Theta Music Trainer. The site features tons of free games and interactive tools for learning the fundamentals of harmony, melody, rhythm, and sound. For a deeper dive, enroll in the site’s Ear Training courses. If the six-string is your instrument of choice, Guitar Tricks should be your first stop. This comprehensive resource boasts 11,000 video lessons with more added weekly. It also has a huge library of popular songs in every genre from bluegrass to surf. The site’s most impressive feature, though, is its Core Learning System—a step-by-step process that provides a path from basic to advanced techniques, no matter which style of music you choose. Basic access is free, but you’ll need a paid subscription to take advantage of all the site has to offer. Zebra Keys offers more than 50 free lessons for budding pianists. Using flash animations, the lessons cover everything from getting acquainted with the keyboard to scales and chord progressions. You can even put what you learn to work by playing along with popular songs on the site’s virtual keyboard. The site also offers a selection of sheet music and ear training tools. Technology has lowered the barrier to learning to play an instrument. The rest is up to you. Aim to spend some time with your instrument each day using the resources discussed here and by this time next year you’ll be the hit of your holiday parties.